The younger brother of head coach Richard Horne helped seal battling Doncaster RLFC’s fate in Sunday’s Betfred League One clash at Bootham Crescent. With second-placed York City Knights hanging on to a 19-16 lead Graeme Horne touched down a couple of minutes from time to put the result beyond doubt. “I certainly thought the 31-16 scoreline flattered them,” said Horne. “I could accept those two late scores because we were having to chase the game at that stage. “Overall the performance was there but just not the result and that’s what we need to be getting. “I thought the sending off of the two props early on made it more difficult for us with having a new half-back in. “It also affected our rotation and Jansin Turgut probably played more minutes than I wanted him to but he was sort of our only athletic middle and with them moving us about I couldn’t afford to have big forwards out there all the time. “Considering the sendings off and the heat I thought it was a really good game between two really good sides. “We spoke before the game about York being really clinical and they were. We had a couple of other opportunities which we didn’t take - notably when Sam Doherty failed to get the ball down after collecting a kick to the corner in the first half. “That would have cut their lead to just two points with the kick to come. Those sort of things are game-changers. Even so we were still in the game at 13-6 at the break and they knew that. The game marked the debut of former Keighley scrum-half Matty Beharrell. 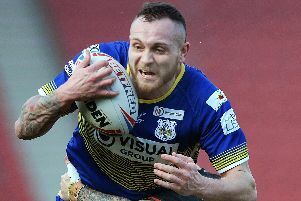 “Despite only having one full training session with us I thought he tried hard and had a hand in two of our tries and that’s why brought him in because we need to be scoring points,” said Horne. “He’ll get better for us the more he plays.